Nowadays each and every individual has a smartphone which comes with various apps running in it. This small size gadget comes with a great package with functions of having image, movies, text editors, games and etc. Therefore, people find it desirable to keep it all together on their mobile phones since it is portable and can be carried anywhere, but on other hand they find it annoying and frustrating to manage their job on a small screen and small keypad, where you have to drop your fat finger on those little keys. If human can compress the technology in the form of mobile phones, it can expand the same without any difficulty. Now, to solve this inconvenience, a management tool known as MoboRobo was developed which supports both the Android and iOS operating system. This is an easiest way of operating and managing you smartphone through PC. You can also think of it a as PC which will handle your calls and messages! This program was designed keeping in mind those people who use uses their laptop on daily basis and who can easily manage their phone job during their busy schedule. And if you think that before you get your hands on it, you have to hefty price then don’t worry, it’s free! You can simply click on the official site and download it. The installation process is similar to other setups and you need not to worry. Once you are done with the installation, open it and you can see the dashboard. 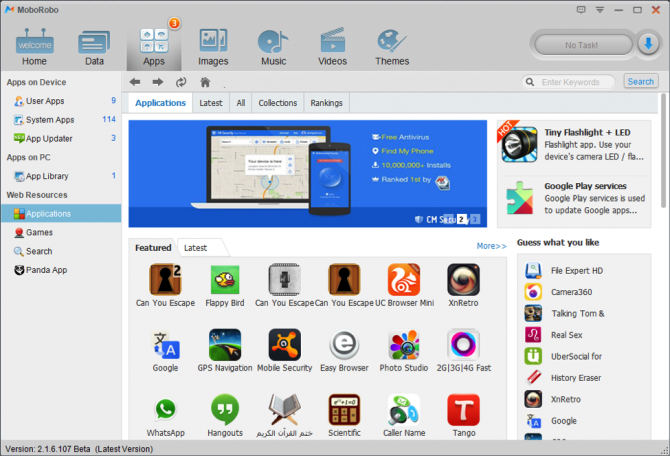 Now this dashboard of MoboRobo basically showcases the present view of your mobile phone along with occupied storage, battery life and etc. Whenever a new software or device comes in the market, the first question that always rises is about its UI (User Interface). As it has been mentioned above, MoboRobo tool has a very easy to manage and simple UI. The MoboRobo gives you two methods to set up a connection between your PC and the Smartphone. One is via the Wi-Fi and other is via USB which recommended. The USB method basically provides you smartphone with more access than the latter. First what you have to do is to enable USB debugging option in your phone setting. The second one requires you to enable the wireless connection of your PC. The call logs, messages and contact come below the Data Section in MoboRobo tool. All such basic apps category showcases the list of your phone’s contacts, messages and call logs. 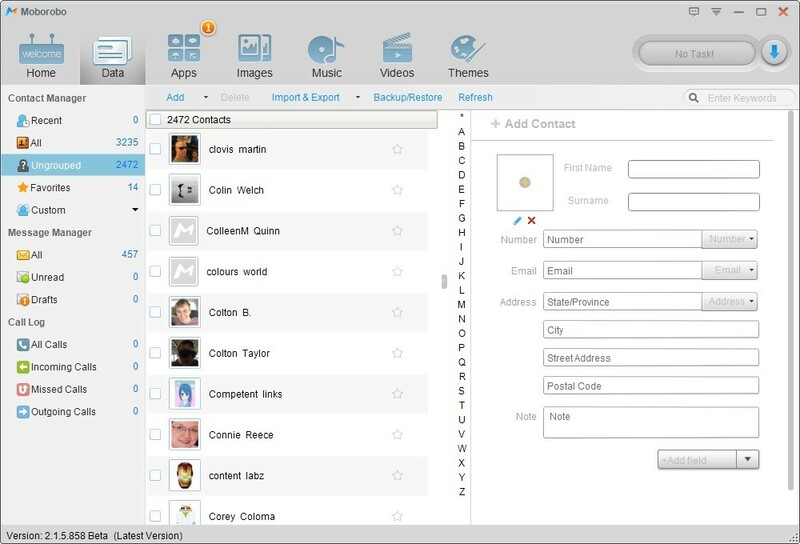 The phone’s contact list can be administered by making use of the Add, Edit, Delete and Import/Export options given. You can also outlook the list in different categories. 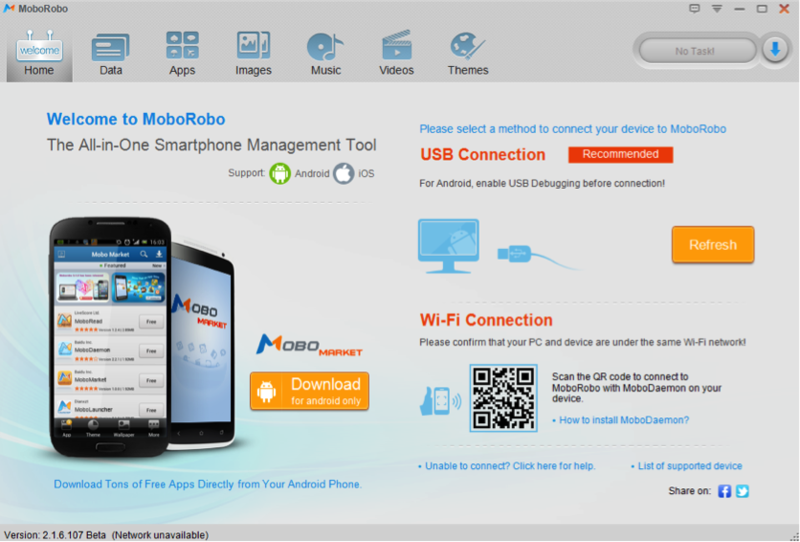 One of the attracting features of MoboRobo is you can take your phone calls and even reply to messages through you PC. 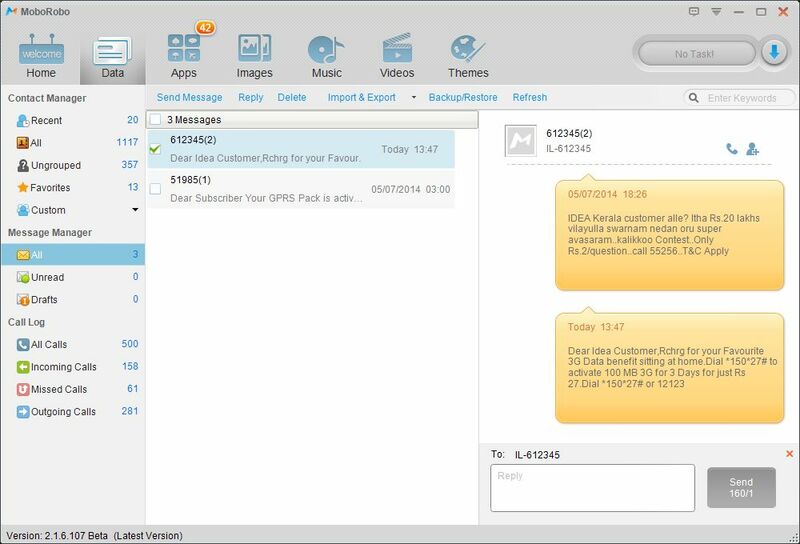 When you get a text on your cell phone, MoboRobo gives you a notification and simultaneously you can reply the sender by typing on your computer and sending it through MoboRobo tool. To make a phone call, just click on the call button and the phone will be given orders to make call to the selected contact. The usual apps such as gaming apps which are already present in your phone come under theApp section area. App Store is available under the App Updater to download and install your choice apps. You also enjoy the option of transferring your app from phone memory to SD card or otherwise. MoboRobo proves itself best in the field of media apps. One can relish watching videos and images on bigger screen of the PC rather than on smaller screen. For the multimedia apps there are distinct categories such as Music, videos, images and themes. The image section will display all your current photos available in your phone’s Gallery. The music section will showcase all the music files and same way he Videos section showcases all the video you have stored in your phone. Just similar to the App Store, there you will also find Media Store where you have the option of downloading ringtones, wallpapers and themes for your iPhone. Hence, MoboRobo also takes care of those typical multimedia freaks. 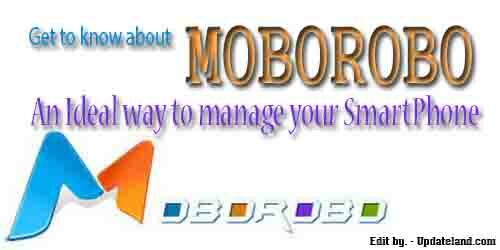 This is one option which is required by almost every user and MoboRobo manager offers it you. Where a lot of data of the user has been contained and installed, it becomes pretty obvious that you expect backup facility from the tool as well. Users can their entire phone’s data on their PC and if you lose your data on phone then you have the backup stored in your PC already and use it to restore your phone. The Phone Clean up cleans away the entire cache file and subsequently, more amount of space is invented in phone memory and which will also increase the speed of your phone. Once you go through all the features and use MoboRobo tool, you will appreciate that it’s a complete user friendly interface. Even for those who are not a computer geek can make use of this tool with ease. All the categories have been showcased differently so that user can switch to different tasks easily. Whenever you move your cursor on every option available, a small notification comes into sight giving you a detailed brief. Hence, this cybernetic globe of your Smartphone on PC is amazing thing to contract with. Isn’t it attracting managing and accessing your mobile phone through PC? Yes, definitely it is in my opinion and in yours too after reading about this tool. All in all, this tool seems promising which will get max out of your phone and also considering it’s free of cost; it seems like the best way to manage tasks of your Android/iOS device. Also lack of adware will make you confident to use it. Download this tool right away for free of cost and experience the big screen phone organization. FeedEgg - Lifehacks for You Copyright © 2019.